Products--Huzhou Hengxin Metal Products Co.,Ltd. A. Double locking TV headrest provides added comfort while lounging or watching TV by raising the upper body. B. Body support tubes and wires together enhance support in the body section to eliminate sagging. The dual welded offset tubes keep the unit square and enhance unit strength. C. Contoured seat section offers a wider seating area by allowing seating close to the arm. D. Engineered low profile linkage keeps all metal parts below the mattress line while being the easiest to operate industry. 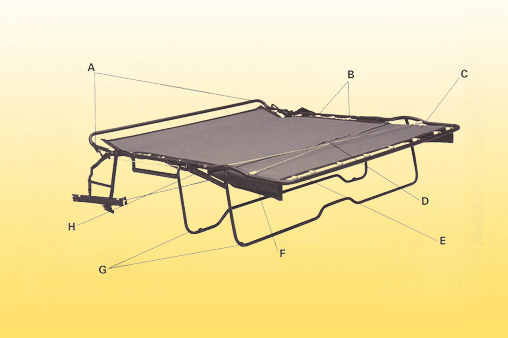 E. Optional seat support wires provide support while sleeping, plus adding durability to the overall unit. Support wires also give the quality feel of stationary seating. F. Extended polypropylene decking is designed to extend beyond the metal frame and linkage parts eliminating any metal to upholstery contact. G. All tubular frame construction provides a smooth and visually appealing look with improved safety(eliminated pinch points) and comfort in the seated position. H. Dual one piece tubular legs provide enhanced stability and strength, allowing the unit to be operated from the center or side position.